What to Expect This moderately-paced, locally hosted tour includes a reasonable amount of walking or hiking and requires an average level of physical fitness. 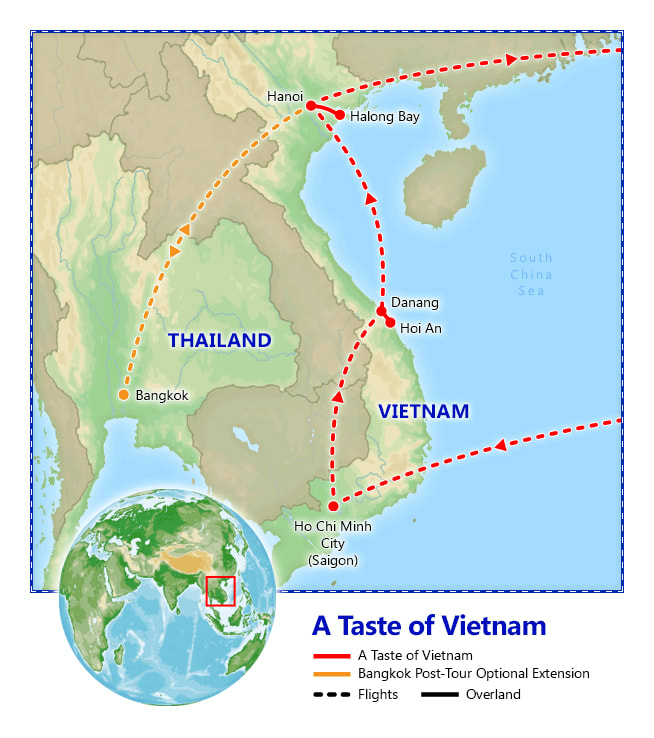 If you've put off a trip to Vietnam because of time or price, then our A Taste of Vietnam tour package is for you. See for yourself why Vietnam has emerged as Asia's hottest new destination for Western travelers. Our 10-day escorted tour takes you to Vietnam's two most important cities—Ho Chi Minh City (Saigon) and Hanoi, as well as picturesque Hoi An and Halong Bay. Explore on your own or on exciting optional tours to the Cu Chi Tunnels, My Son and more! You'll enjoy superior accommodations, bountiful daily breakfasts, included sightseeing tours in each city, discounted optional tours, and as always, the very best in Friendly Planet service. Of course, all of this is yours at prices that are downright amazing! 1. 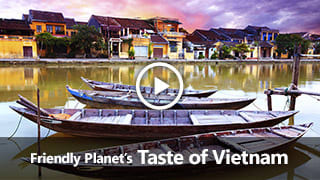 Includes Mekong Delta, Cu Chi Tunnels, My Son, and Authentic Life in Hanoi. Optional Excursions Package must be pre-booked to receive discounted price and requires a minimum of 3 passengers to operate. 1. All visitors to Vietnam must obtain their own visa before departure. Comprehensive visa instructions will be included in your confirmation packet. Note the above fee is an approximate cost, as it varies depending on the type of service you request. The listed amount is based on a single-entry visa obtained from the Visa HQ website. 1. The Bangkok extension requires that your flights be confirmed separately by the airlines. Please note that it typically takes 3 to 5 business days to confirm your extension flights with the airline, and that we will notify you immediately upon confirmation of the flights. This extension also requires a minimum of 2 passengers to operate. Final pricing is based on flight availability at the time of booking. 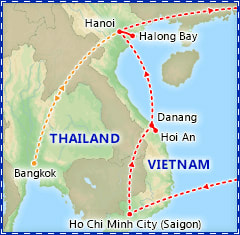 Accommodations: 2 nights Grand Hotel Saigon or similar. Included meals: Dinner. Full Day Itinerary: Arrive in Ho Chi Minh City and transfer to your hotel, located in the heart of the city and within easy access to shopping, touring and dining. This afternoon, explore dynamic Ho Chi Minh City (still called Saigon by many locals) on an included comprehensive city tour. Begin at the historic Reunification Hall, which formerly served as the Presidential Palace. It was towards this modern building that North Vietnamese resistance fighters’ tanks (the Viet Cong) rolled on the morning of April 30, 1975 as Saigon fell. From 1885 to 1954, Vietnam was the French colony of Indochina, and you'll see remnants of the French influence throughout the city. You'll visit the ornate French colonial Saigon Post Office, built by the famous architect Gustave Eiffel, where locals still come to post letters and make international calls from the beautifully trimmed phone booths inside. Later this evening, join your fellow travelers during a welcome dinner. Optional Excursion: A Day in Ben Tre with lunch, $80 (IF purchased locally). Depart your hotel this morning heading south to the Ben Tre Province. Stop along the way to discover how Vietnamese farmers work in the rice fields and observe the daily life of the villagers of the Mekong Delta. Next, cruise the small canals and arroyos of the Mekong lined with palm and coconut trees. Sip on Vietnamese honey tea while strolling through fragrant fruits orchard and learn more about "Mekong Culture." Before returning to Ho Chi Minh City this afternoon, enjoy lunch at a local restaurant offering freshly caught fish. Minimum 3 passengers to operate. Optional Excursion: Saigon Nightlife by Vespa, $125 (purchased locally). Tonight offers a chance to experience the vibrant nightlife of Saigon from the back of a vintage Vespa scooter. The city comes alive at sundown and people congregate on sidewalks, parks and all over the city. The first stop on your culinary exploration will be to sample some light evening snacks and refreshments at a roof top bar. Continue through the city streets, seeking out bustling stalls serving authentic Vietnamese dishes. Conclude the evening at a hidden cafe where you can enjoy a musical performance over a drink and ice cream, and see the new generation of Vietnamese unwind and flaunt their unique style. Minimum 2 passengers to operate. Day 5: Ho Chi Minh City, Da Nang & Hoi An. Accommodations: 2 nights Hoi An Historic Hotel or similar. Included meals: Breakfast & dinner. Full Day Itinerary: After breakfast enjoy the morning at leisure, or take advantage of an optional morning excursion to the famous Cu Chi Tunnels. This afternoon, transfer to the airport for your flight to Da Nang on the coast of the South China Sea. Upon arrival, board your touring coach and continue to Hoi An. The colorful market town of Hoi An is an exceptionally well-preserved example of a major Southeast Asian trading port from the 15th to the 19th centuries, with ships arriving from all over the world to obtain silk and other fabrics, sugar, tea and ceramics. Hoi An's traditional Vietnamese architecture has been preserved, and there are many historic temples and pagodas in the area. Enjoy the rest of the day at leisure to explore on your own. You might want to take advantage of Hoi An's world-famous tailors during your stay here. Anything you might want to wear can be made for you in Hoi An, all at bargain prices and with expert workmanship. This evening, join your fellow travelers for a special dinner at a unique local restaurant. STREETS International is much more than your typical restaurant, it is an innovative vocational training program for underprivileged children to learn hospitality management, entrepreneurship skills and the culinary arts. Tonight, you’ll support the program and enjoy a delicious dinner prepared by the students. Optional Excursion: Cu Chi Tunnels, $55 (IF purchased locally). The Cu Chi Tunnels were built by the Viet Minh in the 1940s. This incredible network of tunnels once stretched for 210 miles and contained extensive Viet Cong infrastructure including tactical quarters, storage rooms, kitchens, a school and even an underground hospital. Most entrances were so well disguised that only a small portion of the system was ever discovered during the war, despite the fact that some 125 miles ran under a U.S. military base. You can enter the tunnels if you wish, or view them from outside. Minimum 2 passengers to operate. Optional Excursion: Hoi An walking tour, $35 (purchased locally). Embark on a morning or afternoon optional walking tour through the streets of Hoi An, once a major Asian trading port in the seventeenth and eighteenth centuries. Hoi An's architecture and relaxed lifestyle have changed little over the years. Explore the ancient town center and visit the sites of former merchants' homes, a 400 year-old Japanese Covered Bridge, and a Chinese Communal Hall. Before you return to your hotel enjoy browsing and shopping in one of the most colorful local marketplaces in all of Asia. Minimum 2 passengers to operate. Optional Excursion: My Son & Phuoc Kieu Village, $55 (IF purchased locally). Enjoy an optional half day trip, departing in the morning, to visit the capital and religious center of the former Champa Kingdom, My Son, situated in a lush green valley 40km southwest of Hoi An. En route, enjoy a short stop at Phuoc Kieu Village, a 500 year old village specialized in bronze crafting. Walk around the village's streets and visit a workshop (if available) and a temple where locals worship their ancestors. Continue on to the cultural highlight of Central Vietnam, the temple complex at My Son. Granted UNESCO World Heritage status in 1999 the tower-temples were the seat of the Champa Kingdom for the majority of its existence between the 4th and 13th centuries. The sanctuary is situated in an impressive location surrounded by hills. Wander through the impressive ruins then visit a small museum at the entrance to My Son before heading back to Hoi An. Minimum 3 passengers to operate. Accommodations: 1 night Novotel Halong Bay or similar. Included meals: Breakfast & Lunch. Full Day Itinerary: After breakfast, transfer to the airport for your flight followed by touring coach transfer to Halong Bay. En route visit China Beach then continue to the airport. After a short flight, board your touring coach and transfer to lunch at a local restaurant. Afterwards, travel through the rich farmlands of the Red River Delta to your hotel in Halong Bay for check-in. The balance of the day is at leisure. Accommodations: 2 nights Silk Path Hotel or similar, Hanoi. Included meals: Breakfast & lunch. Full Day Itinerary: This morning, transfer to the pier to set sail on your private junk for a 5-hour cruise on the emerald green waters of Halong Bay. Enjoy a fresh seafood lunch as you cruise amongst the spectacular limestone islands. This afternoon, return to Halong Harbor then transfer to Hanoi. En route to Hanoi, stop by the tranquil Yen Duc Village where you will learn about the local life and traditions of the village, and admire the charming fields surrounding the area. Later, enjoy a water puppet show by the local artists. After your visit, continue to Hanoi. Upon arrival, you will be escorted to your hotel for check-in. Full Day Itinerary: This morning's half-day tour of Hanoi begins with a view of Ho Chi Minh's Mausoleum as well as exploring his private residence from 1954 until 1969. The wooden ethnic minority style house, which was built on stilts, is surrounded by peaceful gardens. In the same complex you will see the One Pillar Pagoda, founded by King Ly Thai To in 1049. This structure has become an important symbol for the people of Hanoi. Continue on to the Temple of Literature, Vietnam’s first university. Constructed in 1070, the gardens and well-preserved architecture offer a glimpse into Vietnam’s past. Conclude your tour with a visit to Hoa Lo Prison, also known as the "Hanoi Hilton." This notorious prison got its nickname during the Vietnam War—which the locals call the American War, one of many endured in recent times. Long before Americans were imprisoned here, many Vietnamese who fought against the French were held here. Enjoy your last evening in Vietnam at leisure. Optional Excursion: Authentic Life in Hanoi, $42 (IF purchased locally). Your afternoon optional excursion offers you the chance to explore Hanoi through the city's Old Quarter known as the 36 Streets. This bustling area of narrow streets and lanes is home to literally thousands of small businesses and shopkeepers. There's no doubt that these are entrepreneurial people and you'll see the evidence as you wind your way slowly through the quarter. There are tiny restaurants, with single burner kitchens set out on the sidewalk, kiosks for shoes, hats, suitcases, clothing and food, and many women carrying herbs and vegetables in flat baskets suspended from each end of a bamboo pole which is carried perfectly balanced on one shoulder. You'll find plenty of photo opportunities all around you, so have your camera ready. Pass by Hoan Kiem Lake and admire the colonist architecture evident from the St. Joseph Cathedral. Escape the hustle and bustle to Nha Chung Alley where you will get the chance to meet with a local and discover an in depth view of the lives of Hanoi residents through three generations. Continue to the railway, which played an important role during the Vietnam War and built during French colonial rule. End the tour with a stroll through Hanoi's Old Town. Minimum 3 passengers to operate. You can book these excursions individually in Vietnam. But you can save over $25 if you purchase this special package ahead of time—with or before your final payment. These are not "seat in coach" excursions that pick up passengers at various hotels; all are operated for Friendly Planet groups only. Optional excursions require a minimum of 2 or 3 passengers to operate. Why not take advantage of your already included international airfare and add three days in exotic Bangkok, bustling capital of Thailand? Your extension includes airfare from Hanoi to Bangkok, three nights at a deluxe hotel, half day city tour, full buffet breakfast daily, and all group transfers! 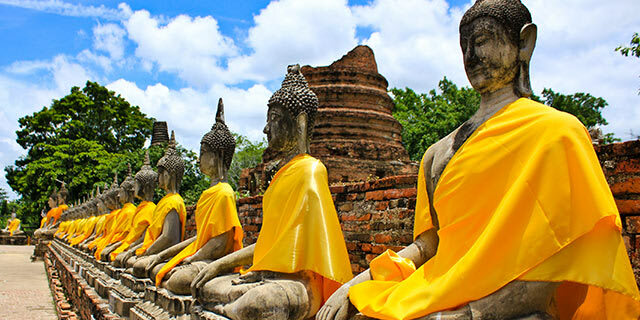 Full Day Itinerary: Transfer to the airport to board your short flight to Bangkok, bustling capital of Thailand, situated on the banks of the Chao Phraya River. Upon arrival, you'll be escorted to your deluxe, centrally located hotel. The rest of the day is yours at leisure to take in your new surroundings and explore the city independently. Your hotel boasts a prime location within walking distance to many attractions. Full Day Itinerary: After breakfast, enjoy a half day sightseeing the major landmarks of Bangkok. Begin the day with a visit to the Grand Palace, which for 150 years functioned as the home of the King and his court as well as the entire administrative seat of government. Within its grounds, you'll also visit the Temple of the Emerald Buddha (Wat Phra Kaew) built to house a large Buddha image carved from a solid piece of green jadite (jasper). Continue to Wat Pho, Bangkok's oldest temple, which is home to the magnificent reclining Buddha as well as the first school of traditional medicine and Thai massage, and is also regarded as Thailand's first University. Grand Hotel Saigon is one of the oldest hotels in the city. It was completely restored in 1997. Nestled in Saigon's scenic riverside area and within walking distance to major commercial and entertainment addresses, this French colonial style hotel provides the perfect base for having a completely relaxed vacation. This 4-star hotel is located in the heart of old town in close proximity to shops and other attractions. The Hoi An Historic is admired for its location, charm and world-class facilities. 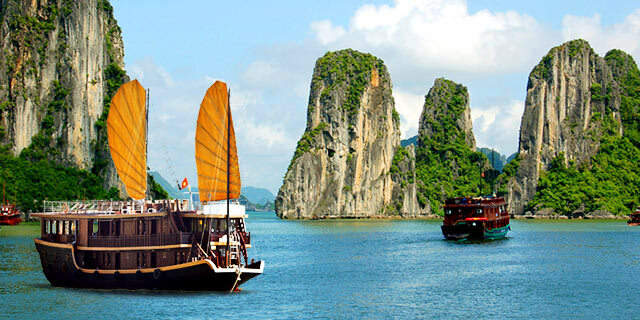 The Novotel Halong Bay is a 4-star hotel, overlooking the mystical landscape of Halong Bay. Nestled in the heart of Hanoi, the Silk Path Hotel affords discerning travelers an unrivalled value to explore all the attractions and culture that the city has to offer. The distinctly eclectic décor marries beautifully with all the modern facilities, creating a truly indulgent experience. What should I know about Vietnam? Check out our guide for travel tips, the best time to go, blog posts, videos, and more.